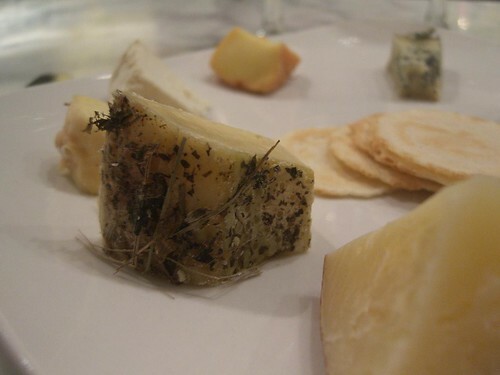 Aged Crottin, Jacquin, France + Fresh Crottin, Vermont Butter and Cheese Co.
It’s National Goat Cheese Month and we’re determined to celebrate it to the fullest here at Cheese+Champagne. We’ve already sampled most of the American goat cheeses on our list, though, so this week I found a French cheese from the list, the Jacquin Aged Crottin. For comparison’s sake — and because I suspect National Goat Cheese Month was designed to promote American cheeses — I also picked up Vermont Butter & Cheese‘s fresh crottin. Fromagerie Jacquin‘s Aged Crottin is a product of the Loire Valley, where the traditional young goat’s milk cheese recipes (Crottin, Selles sur Cher, Valencay) must be adapted to use pasteurized milk in order to meet the FDA’s import requirements. There’s an interesting tidbit at Artisanal about their work transporting and finishing the cheeses to maintain raw-milk characteristics in these deceptively complex cheeses. 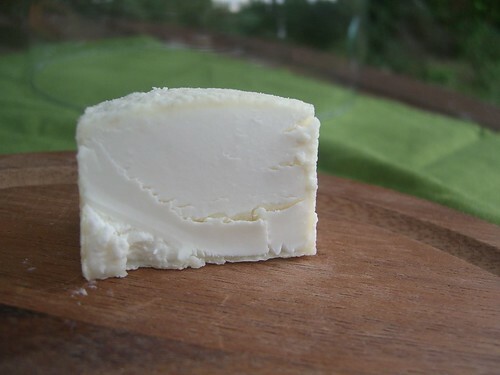 The aged crottin is a dense little dimpled ball of goats-milk that loses its goaty tang to mellow with age; firm and a little bit gamey, it has a buttery rich flavor. These cute little doorknob-sized cheeses are perfect for summer entertaining. I made a late afternoon cheese board of the two, a bright citrusy Salumi Agrumi, and a fig-olive tapenade whose sweet-salty tango was perfect with the mildly tangy crottins. 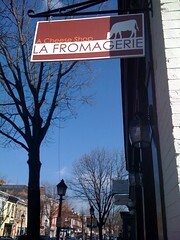 Fromagerie Jacquin suggests a Sancerre or “rouge corsé” with the aged crottin; I enjoyed it with a Virginia Petit Verdot from North Gate. P.S. I found the Jacquin aged crottin at the Italian Store in Arlington, Va.
As someone who attempts to eat mostly locally, particularly during the summer months, I generally look the other way when purchasing cheeses shipped by plane, train and auto across the Atlantic or from the West Coast. Sure, I have plenty of fine, local cheeses to incorporate into my weekly all-local meals, outside of the scope of our “100 Great Cheeses” list. But as the French national holiday Bastille Day approached, I began to wonder, is there anything France can do that we haven’t tried in the US? 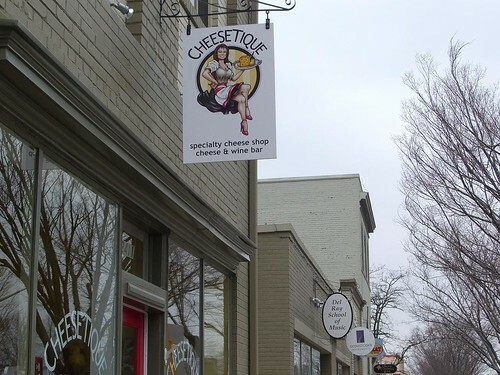 Would an all-American cheese and sparkling wine tasting leave us wanting something more? 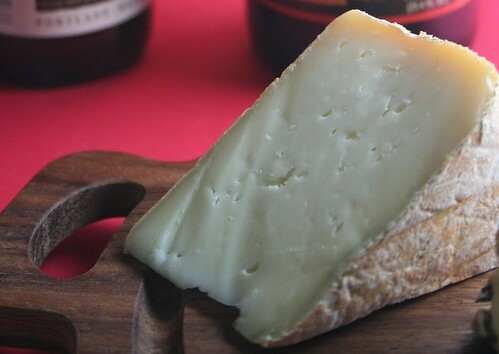 Jasper Hill Farm‘s Constant Bliss (Vermont), made in the raw-milk tradition of chaource but with only the uncooled evening milk of their Ayrshire cows, this rich, buttery cheese seems like a double- or triple-creme, and pairs perfectly with a sparkling wine. Roth Kase‘s Grand Cru Gruyére Reserve (Wisonsin), another raw milk pick, is as smooth as any French gruyére, with fruity, nutty notes. 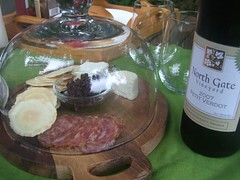 I loved this with the chocolate and both the bubbly and beer. Sartori Raspberry BellaVitano (Wisconsin) is a cheddar-textured cheese soaked in New Glarus Raspberry Tart Ale for a decidedly American flavor. As smooth as a comté, the added berry tang makes this a nice match for sparkling wine. Salemville Amish Blue (Wisconsin) is a very mild, sweet buttery blue that would not be my first choice among American blues. It was actually almost too sweet for the ale, but was mild enough not to overpower the sparkling wine. 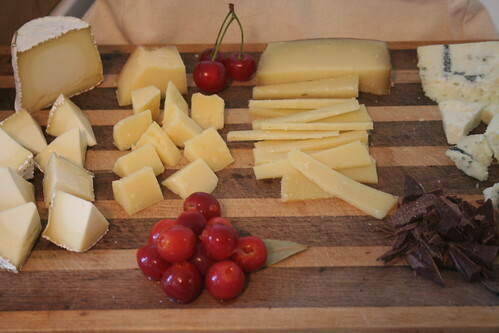 I paired the cheeses with homemade pickled sour cherries (following a French recipe), Taza Mexican-style chocolate from Massachusetts, Thibaut-Janisson sparkling wine from Virginia, and Southampton Abbot 12, a Belgian-style ale from New York. Not exactly a 100-mile cheese board by any means, but still entirely sourced from the Eastern half of the United States. 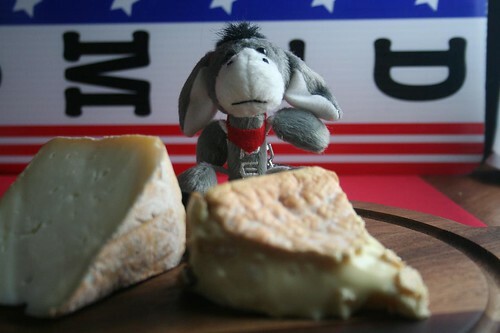 The Constant Bliss and Thibaut-Janisson were just as sweetly matched as chaource and champagne, while the more sweet than tangy American blue was more appreciated by the blue cheese-adverse than those of us with a weakness for Roquefort. All in all it was a solid showing by the Americans. And what did we eat following the tasting? All-American buffalo dogs on the grill and a cherry pie for dessert. Vive la Revolución Américain!